Zamzam well is well of spring water in the area of the Holy Mosque, in the southeast of the Kaaba. The total depth of the well is about 42 feet. well water has a privilege, which is even pumped for 24 hours and can spend as much as 8000 liters of water flow per second, but well has never dried up and even can be replenished after 11 minutes pumped, but never overflow to flood the surrounding places. This well will be filled up to a distance of 13 meters in water level above the soil surface. 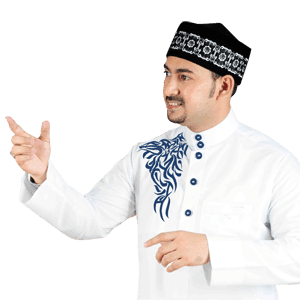 Historically, source of Zamzam was found by Siti Hajar after running around back and forth between the of Safa and Marwah under an instruction of the Angel Gabriel. At that time Ishmael, son of Hagar being thirsty in the desert and found no water source nearby. In the early days of the pilgrimage, draw its water was the only way to take the water of Zamzam. The government of Saudi Arabia then paid special attention to this well because of the many pilgrims who came and clustered near the well for drinking water, some even took water to pour onto their bodies as Tabarru while praying. This makes the place around the well Zamzam became dirty and muddy. Pumps and pipes then installed to facilitate the congregation to not have to draw so that the water can come out of the pipe and the pilgrims stay enjoy. Some paramilitary guards will supervise the pilgrims to stay clean and place around the well remains dry. The congregation simply press the button on the dispenser and fill the cups for drinking water freely. The congregation also may bring some permitted amount of Zamzam water to be brought back to the lodgings even to bring it while return to their homeland. 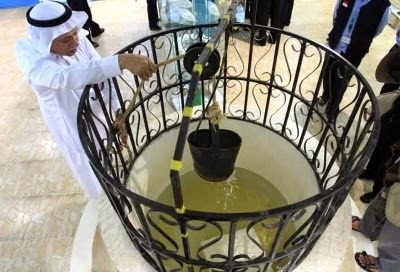 The Body of Geological Survey Agency of Saudi Arabia has Zamzam Study Research Center (Center for the Study and Research of Zamzam) has been analyzed the well water. Water level is monitored by a tool called Hydro Graph which then changed to a more digital tools that can accurately monitor water levels, pH, Eh, temperature and electrical conductor in the well Zamzam . The tool is used to ensure that the taste, color and smell of the water is not affected or changed. Zamzam water has no odor and color but has a distinctive taste, contains a pH of about 7.9-8.0 which indicates that the Zamzam well water contains alkaline similar to sea water. Of water content, we can finally find out some of the properties contained by the water of Zamzam. According to a hadith narrated by Muslim, "The water of Zamzam was blessed. He is a glut of food (and drugs for disease) ". As was said by the Prophet that "(The benefits of) Zamzam water depends on the intention to drink". For those who drank willingly then he/she will be freed from the thirst for God has given primacy to the Zamzam to pour the drinks flow and the bidder's disease. So a bit of the story of Zamzam and usefulness so there's no doubt for us to drink and if God will, to give the blessing of health and medicine for the disease. Aamiin.